Mario began his investment career in 1999 with Vanguard mutual funds in Valley Forge, PA, where he consulted institutions and financial advisors on investment policy, portfolio construction, and Exchange-Traded Funds (ETFs). He also contributed to the research and publication of the firm’s world-renowned investment philosophy and served as a municipal bond fund specialist. In 2003, he earned the Chartered Financial Analyst designation, widely regarded as the highest standard in the investment profession, and he continues to mentor aspiring Charter candidates in its curriculum, ethics, and career opportunities. 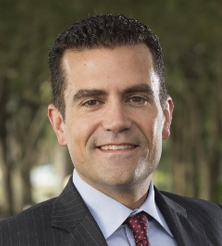 Mario relocated to Charleston in 2010 to serve as Chief Investment Officer and Chief Compliance Officer for a respected financial planning and advisory firm before establishing East Bay Financial Services, the collaborative partner firm of Prosperity Advisers, LLC. Mario is Past President of CFA Society South Carolina, current Chairman of the College of Charleston Finance Department Advisory Board, and is a member of the Financial Planning Association. His approach to investments and the industry has been featured in Investment News, NAPFA Advisor Magazine, Charleston Regional Business Journal, The Post & Courier, and The Northeast Pennsylvania Business Journal. Mario is active in recreational sports and the Charleston community. He is an avid traveler and SCUBA diver, and enjoys spending time outdoors with his wife, Piper, and their “energetic” lab/shepherd mix, Cady.